Typically, jokes aren’t meant to be taken seriously. Typically, they are exaggerations of facts usually said just for laughs. Nonetheless, as the old saying “Jokes are half meant” goes, there is some truth to a joke. But who would have guessed that the underlying truth of something so simple can lead to marriage? Jots and Winch met at a Baguio Youth Camp back in year 2005. Jots was the epitome of Winch’s ideal guy: tall, dark, and handsome. However, Winch explains that even if she thought of him as good-looking, she didn’t see Jots as a potential partner. Likewise, Jots perceived Winch as the “masungit”one and didn’t think of her as marriage material. For a few more years, Jots and Winch barely interacted. Though they walked around the same circles, they never regarded each other as more than mere acquaintances– until a joke started it all. “I was forced to reveal who my crush was to Winch’s sister.” Jots confessed, however at the time—being the prankster that he was— he decided to claim that Winch was his crush and that they have been together for quite some time. Astonished by the news, Winch’s little sister decided to spread the word. The news spread from one person to another—to the point that it even reached both their parents! To everyone’s knowledge, the two had already become a couple—well, everyone except Jots and Winch themselves. Eventually, the two needed to sit down and set things straight—they couldn’t leave their families and friends with the wrong information. But instead of fixing the misunderstanding, this prompted that the pair spend more time together. As opposed to the years of silence since they’ve known each other, they spent three months of texting, calling, and dates. When it’s a match made in heaven, you can be sure that fate will be on your side. After only officially being together for three days, Jots proposed to the girl he knew he was destined to marry. While some may call it absurd, others call it romantic. “When you’ve met the person you want to spend the rest of your life with, why wait?” Winch reciprocated the same feelings claiming that Jots was the answer to her many months of prayer. This time around, they finally saw eye to eye. Jots and Winch had a long engagement which gave them more than enough time to plan for a wedding. First on their list was to book a venue for their wedding day. Their venue of choice was Oasis Manila as it had nearly everything they wanted. Oasis had just revealed their newly opened venues which impressed the couple. Moreover, the reception’s venue was only a floor down from the wedding ceremony, Oasis Manila practical set-up was definitely a perk to the to-be-weds. Planning for the rest of the wedding details came in one after the other. While brides in general are usually more hands-on during the entire wedding planning process, Jots wasn’t afraid to share the responsibility with his future wife. The two were synergized: while Winch got down to the nitty-gritty, Jots was more of the visionary: they both discussed and planned what they wanted to have for their wedding celebration. This was especially true when it came to the food. Jots and Winch both agreed that good food was a priority in their wedding which allowed them to choose Hizon’s Catering and Corporate Canteens to be their official wedding caterer. Aside from Hizon’s being one of the accredited caterers of Oasis Manila, Hizon’s offered wonderful packages and a sumptuous food tasting experience. Given that both Jots and Winch know good food when they taste it, the Quezon City-based catering service definitely hit their mark. Delicious food was a given considering Hizon’s brand name but what Jots and Winch were more impressed the company’s budget-friendly catering packages that came with a long list of freebies. 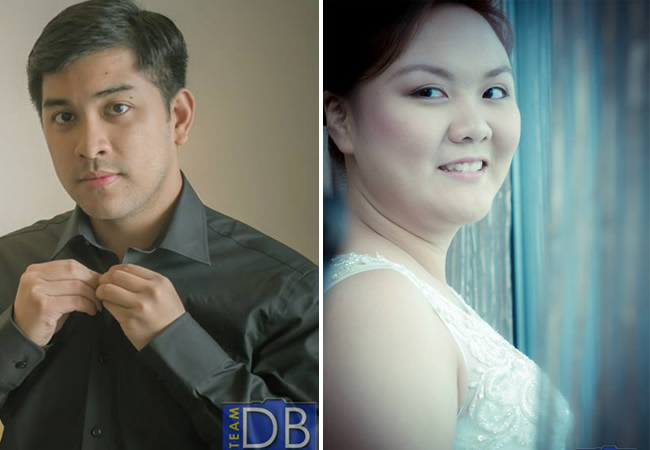 So with good reviews and a thumbs-up from the Oasis Manila team, Jots and Winch had Hizon’s booked for their wedding. Planning the wedding details followed afterwards, this forced Winch to bring out her DIY skills. Winch shared that all the wedding invites and table numbers were do-it-yourself. From the layout, design, printing, folding, and inserting, Winch had a team of loving sisters and a mom to help her out with the invites. Jots, on the other hand, proudly exclaimed that he provided the extremely important role of as the printer. While touches of DIY crafts make a wedding special, what made Jots and Winch’s wedding even more memorable was that it was Jots’ father and Winch’s father who married them. Nothing beats the personal connection extended by loving fathers on an occasion like a wedding. Other than the exchange of vows, tears were also shed during the pastors’ heartfelt messages to the couple that made the day even more emotional. As Jots and Winch recalled their wedding day, everything did go as smoothly as planned. A word of advice they would give to soon-to-be wed couples would be to make sure to keep arrangements with suppliers clear and concise. “There are certain loopholes that some wedding suppliers may fail to mention so make sure to keep particulars as detailed as they can be.” Keep everything in writing to make sure that expectations will be met during the day of the event. Though their connection as an item had started out as just-for-laughs, who would have thought it would bring two people who were practically strangers together? More importantly being strong, instilling patience, and having faith were the core values of their entire wedding preparation process. “You will fight during the preparations, especially when stress and frustrations arise. Rather than just focusing on every single detail, focus on the importance of the wedding,” explained Jots and Winch as they try to finish each other’s sentences. While jokes are really not meant to be taken seriously, this particular story had a joke that started Jots and Winch laughing all the way to the altar.